I love tea. I've always loved tea since I was a young child and that love has grown to include many herbal teas too. I’m not a coffee lover. I've tried again and again over the years to make myself love it but apart from the lovely aroma of freshly made coffee, it does nothing for me. So when Lulin Teas asked if I’d like to try some of their traditional Chinese tea I jumped at the chance. I've always enjoyed a refreshing green tea at the end of a Chinese meal and not long ago I tried Oolong tea for the first time and loved it. So lucky me, Lulin Teas sent me a sample pack of their Gunpowder Green Tea and their Tie Guan Yin Oolong Tea. Lulin Teas specialise in Chinese tea as this is where tea began. They hand select their choice of teas from a number of regions famous for producing Chinese Teas so you really are spoilt for choice. I tried the Oolong tea first. I remembered how refreshing I’d found it before so one afternoon instead of having a cuppa I decided to be a little more refined and brewed myself an Oolong. A friend had bought me a proper glass tea maker / pot for my last birthday and since moving house it had been put in a box and forgotten about. This was a great excuse to dig it out and sample these teas properly. So off I trotted to the garage to find my special tea pot for its special christening. Tie Guan Yin Oolong Tea - “This tea is from the spectacular province of Fujian on the Southeast coast of China famed for its Oolong teas, and is also known as ‘Iron Goddess of Mercy’. The tightly curled leaves are a striking green colour but this is not a green tea. Oolong is semi fermented and therefore lies between green and black tea. Once brewed the leaves will open to reveal big leaves with serrated edges and the brew will be a forest green colour. Naturally releasing honey scents this sweet Oolong tea contains complex tastes from caramel, orchids and honey suckle. It is a real treat for anyone keen on Oolong teas”. Once brewed these teas uncurl to reveal beautiful green leaves that look like they've recently been picked. I wasn't expecting this. I felt like I was truly drinking “proper” tea. The aroma of this tea is beautiful, subtle but with lovely honey overtones. It is slightly floral but not too overpowering. It’s a smooth, delicate tea which I found very refreshing to drink. It was a light caramel, green colour and even when left for longer than the recommended 1-3 minutes it was still very drinkable. I enjoyed this tea a lot and it is one of my teas of choice for a refreshing afternoon cuppa. I saved the Gunpowder Green Tea for when we had friends to dinner. I knew that one of our friends particularly liked traditional Chinese teas so it was a great chance to try this one out on a bigger audience. My traditional glass tea pot came out for another outing and we all shared in some lovely green tea. Gunpowder Green Tea - “Gunpowder tea is a form of green Chinese tea produced in Zhejiang Province of China in which each leaf has been rolled into a small round pellet. It is believed to take its English name from the fact that the tea resembles the black gunpowder that used to be used in pistols. Gunpowder tea production dates back to the Tang Dynasty (618–907) but it was first introduced to Taiwan in the 19th century. Gunpowder tea leaves are withered, steamed, rolled, and then dried”. This tea was definitely stronger than the Oolong and other green teas I have tried. It needs to be enjoyed fairly quickly after being brewed. Left too long in the pot it was too overpowering for a second sitting. Therefore it is best enjoyed straightaway and then re-steeped to maximise its enjoyment factor. This tea begins as a light green colour which deepens when left in the pot. Both of these teas can be steeped 3 times in total so a little goes a long way. There are many health benefits associated with tea, particularly green and white teas. Green tea has been linked with helping to reduce the risk of cancer, heart disease, liver damage, diabetes and tooth decay. It has been connected to aiding weight loss too. Oolong tea has also been connected with weight loss and is often promoted as a weight loss drink by some. I have to say that I really enjoyed being given the chance to get back into my teas again. Using my glass tea pot made the experience all the more enjoyable. For anyone interested in purchasing one of their own, Lulin do some on their website along with an array of different teas, gift sets and tea accessories. If you’d like to know more about what Lulin Teas have to offer then pop across to their website. They also have a Facebook page and you can follow them on Twitter. Have any of you enjoyed one of Lulin's lovely teas before. Do let me know if you have. 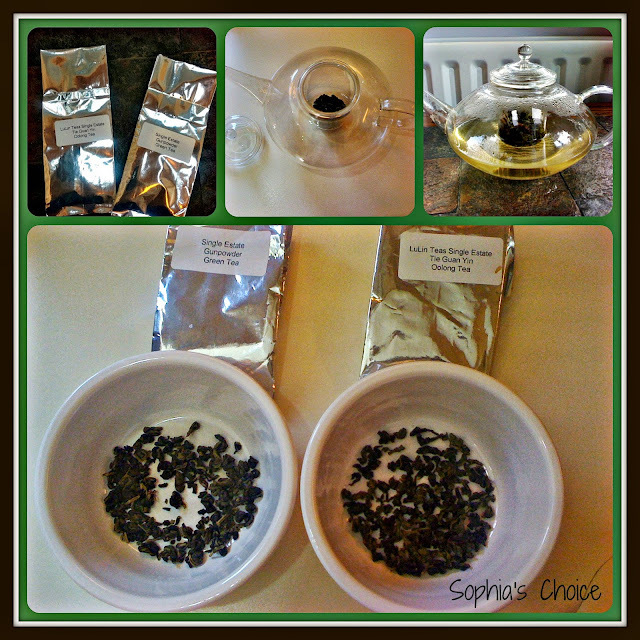 Disclaimer: I was given a sample pack of Gunpowder Green Tea and Tie Guan Yin Oolong Tea to try out and review. All comments, thoughts and feelings are my own. I honestly enjoyed these teas and would like to try more of their range.